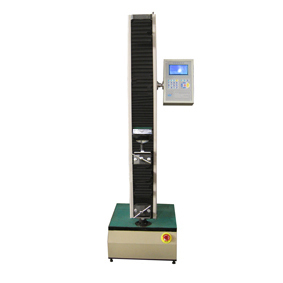 The testing machine satisfies: GB/T16491-2008 Eelectronic Universal Testing Machine and JJG139-1999 Verification Regulation for Electronic Universal Testing Machine. It also satisfies the standards as GB,ISO,ASTM,JIS,etc. The machine adopts cantilever type structure. Loading speed is 0.2-500mm/min, stepless variable speed. Users can freely set the loading speed; Using stepping motor to drive, precise ball screw loading, photoelectric encoder to test tensile distance of sample, with characteristics of loading evenly, stable, without impact, accurate measurement. It adopts microcomputer auto control and data collecting system to realize full digital adjustment to data collection and control process. In the tensile test, it can detect the max. bearing tension, tensile strength, extension deformation, elogation etc. All testing parameters can be automatically calculated according to the original parameters through microcomputer controller and meantime can display test results. Also these parameters both can be inquired and printed. It is mainly used to test tension, compression, bending and other mechanical property for metal, non-metal and composite materials. It is applicable to metal, cementing compound, tubes and pipes, sectional bar, aerospace, petrochemical industry,l waterproof rolls, wires and cables, fiber, rubber, ceramics, food, medical package, geotextile, film, wood, paper and other manufacturing industries and quality supervision department. It is also used in colleges for teaching demonstration.